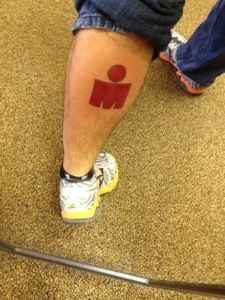 Since the day I registered for Ironman Wisconsin I thought about getting an M-Dot tattoo. Well, I finished the race and I was happy with the result. So it’s tattoo time. The M-Dot isn’t my first tattoo. I have a “tribal” sun on my right arm. If you’re wondering what tribe, it’s a large group of people now in their 30’s that for some reason thought anything tribal permanently inked on their body was awesome. But the M-Dot (corporate logo or not) does have meaning. It represents the year of training & hard work, long rides, long runs, and 15 hours and 12 minutes I spent completing 140.6 miles of racing! Sure it was Madison Wisconsin and not the Big Island, but that doesn’t mean it’s any less significant. Who knows, maybe one year it will be Hawaii. Before I made this sucker permanent, Dave (the tattoo artist) showed me a few different sizes to make sure I got what I wanted. Then it was show time! 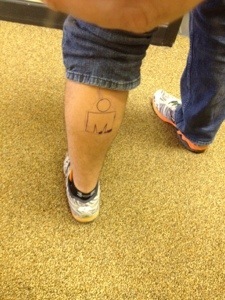 It didn’t take more than a half hour for him to finish the tattoo. And the end result is exactly what I was looking for! I actually got a complement on it in the post office today! My Dad however thought it should be smaller. Previous Post Want a FREE Rudy Wingspan Helmet?